Ceiling fans have been around since 1882 and were invented by the same person who brought us the Singer sewing machine – a clever guy named Philip Diehl. Thanks to their popularity (or necessity in certain climates), the design of ceiling fans quickly diversified to suit different trends and needs around the world. Today, ceiling fans are a must-have for anyone with an eye for vintage accessories, and there are countless styles to choose from. Whether you consider it a necessary appliance or a beautiful décor item, you can’t go wrong with a vintage ceiling fan. If you’re looking for a statement vintage item for your home or business, a classic ceiling fan could be the answer. Some styles are eye-catching and dramatic – and will definitely be noticed by everyone who enters the room – but others are much more subdued and will simply add some antique character to the existing style. Vintage is a recurring trend (or constant, depending on whom you ask), so opting for an old-school design when it comes to ceiling fans is a safe bet. The variety of materials used to get the vintage look – such as pewter, woodgrain and frosted glass – will always have a more elegant effect than modern plastic. The best thing about the ceiling fans listed below is that they look the retro part, but function according to modern standards. 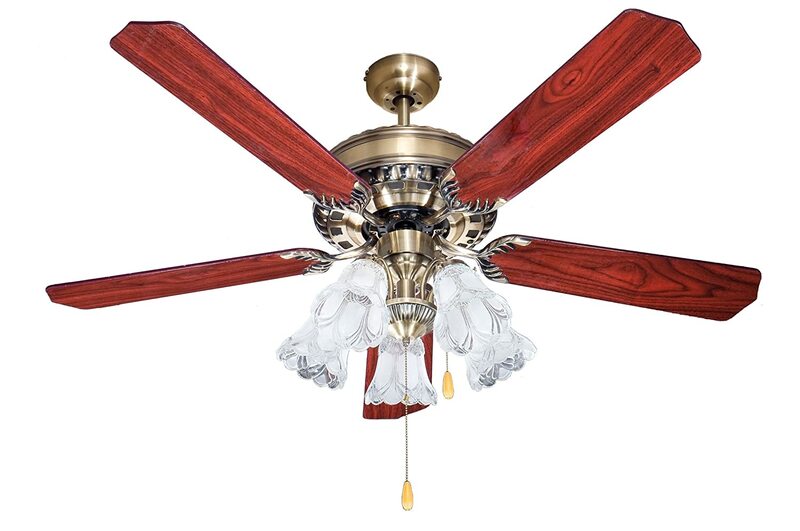 From ornate glasswork to superbly crafted wooden blades, there’s an old-school ceiling fan to suite every taste. The 44-inch Casa Deville Antique White Ceiling Fan is ideal for those who want to add a touch of antique sparkle to their space. The candelabra design with white rub finish and beautiful white-on-white detail create a soft and romantic look. Delicate crystal inserts add to the gorgeous whimsical design. With a 44-inch blade span and 188 x 20 mm motor, this ceiling fan and light combination is as effective as it is beautiful. This unit is operated via pull chain and comes with a six-inch down-rod and four 40 watt bulbs for the candelabra lighting unit. With a three-speed reversible fan function it’s easily adjusted to suit the weather or personal preference. There’s a lifetime warranty on the motor and remote control can be included as an additional option. Perfect to add some antique flair to any indoor space, but with all the modern conveniences. The Merrimack’s contoured metal blades and rippled glass light housing immediately make you think of 1950’s diners and muscle cars. The brushed bronze colour and wire detail around the light fitting give this ceiling fan a rugged, industrial look. It’s ideal for spaces where you want to add a little no-frills vintage. This unit is robust and built for either indoor or outdoor use. Its 52-ich diameter and five broad blades make it the perfect fit for large rooms or outdoor patios. The unit is fitted via a six-inch down-rod, has three-speed reversible function and can be operated via remote control. The Merrimack requires three standard 40 watt light bulbs and has an airflow efficiency rating of 89-CFM/watt. The combination of bronze, wood and glass give this ceiling fan a beautiful aged look that will lend plenty of character to any room (indoor or outdoor), without being overbearing. An elegant classic reminiscent of libraries with bay windows and leather armchairs. The Hunter’s charm is in the detail: antique brass finish and visible wood pattern on the Walnut / Medium Oak blades give this ceiling fan a great old-school vibe. These slightly industrial materials are perfectly offset by a sleek four-light lighting fixture. This unit is designed for rooms up to 485 ft², can be mounted in a standard / flush / angled position and it can be installed with or without the lighting fixture. It features three-speed reversible function and is operated via pull chain. The refined Hunter motor promises to be ‘Quiet for Life’ and wobble-free. To ensure longevity, the Hunter’s blades are coated with the company’s patented Dust Armor that avoids dust build-up. It also comes with a Limited Lifetime Warranty. The Hunter 53063 is sleek and versatile, and its elegant antique design brings warmth and character to any space. The Minka-Aire Twin Turbofan is unique, eccentric and spectacularly retro. This ceiling fan is made to be noticed and will quickly become a talking point in any setting. This specific model is part of the Minka-Aire Gyro collection and the entire unit rotates 360-degrees completing three revolutions per minute. The rotation diameter is 42-inches and it features one halogen light built into the centre column. The speed and angle of the two fan heads can be adjusted independently via an all-inclusive wall-mounted control system. This Minka-Aire combines walnut, metal and glass materials that have received the ‘perfectly-aged’ treatment to give this statement piece an authentic vintage look. Its creative design makes it a bold décor choice whilst its size and range make it ideal for bigger spaces. It’s a fantastic vintage statement piece that’s sure to be noticed. The Hunter 51060 is all about understated old-school charm. With no embellishments, it’s the combination of pewter and visible wood grain on the Dark Walnut / Chestnut blades that give it an antique twist. The blades are reversible, so customers can change the appearance of the fan by placing either the Walnut or the Chestnut finish in the forefront. Equipped with Hunter’s WhisperWind motor, this unit is sleek, efficient, and quiet. With a diameter of 42-inches, the Hunter 51060 has three speeds and reversible blades. Its low profile makes this the ideal choice for low ceilings (under 8ft). Hunter ceiling fans are built to be wobble-free and the company prides itself on its whisper-quiet motors. Designed for rooms up to 100 ft², this ceiling fan will add some vintage flair without overwhelming smaller spaces. The Hunter 51060 has a no-frills vintage look that slots in perfectly with nearly any interior style. The Hunter 51024 is a classic design with dark wood and pewter finish giving it a well-aged look. Five broad blades in reversible Rosewood / Maple surround a frosted glass light housing. The antique pewter base and blade fittings add to this Hunter’s old-fashioned appeal. The unit is designed to look a bit more ‘chunky’ than traditional ceiling fans, giving it a distinct retro shape. As part of the Hunter range, this unit is fitted with an ultra-quiet WhisperWind motor and comes with a Limited Lifetime Motor Warranty. Its low profile is designed to be flush-mounted making it ideal for low ceilings and smaller rooms. The blades are coated with Hunter’s patented Dust Armor that prevents dust from building up when the fan is not in use. This vintage ceiling fan has a 42-inch diameter, is operated via a three-speed pull chain, and requires two 60w candelabra bulbs – although it can also be fitted without the light kit. It’s dark wood and pewter finish give it a slight old-school edge that adds some character to any room. The Makenier Vintage Tiffany Style Stained Glass unit is the perfect choice for big rooms that need a statement piece to tie it all together. The stained-glass light covers make you think of gorgeous country homes with fields of lavender outside the window, or even cosy Irish pubs. That said, this unit works just as well as a contrast piece in a chic urban loft. The central column, motor housing and lamp arms are all finished in antique bronze, while the three Tiffany-style lampshades (all handmade) bring in muted tones of yellow, red and blue. The four curved blades are done in dark-stain plywood. The overall effect is pure vintage indulgence. The Makenier vintage ceiling fan is 42 inches in diameter and 20 inches in height, and comes with a chord switch as well as remote control. This ceiling fan offers a touch of colour and plenty of vintage charm. It’s combination on clean lines and vintage detail make it a fun décor statement in any setting. This Kichler ceiling fan is the ultimate in vintage minimalism. It’s two curved blades are carved to resemble old propellers and finished in a glossy Rosewood. The down-rod and motor housing are done in satin black with pewter accents rounding off the classic vintage look. With a diameter of 56 inches, this Scandinavian-chic ceiling fan is designed for rooms of 400ft², or larger. It features three-speed reversible function and is operated via remote control. This unit is a ceiling fan only and does not include a lighting kit option. Vintage is literally carved into this Kichler fan – with no embellishments it’s old-fashioned look is achieved through the materials used and the shape of the blades. It’s the perfect choice for a clean and elegant look with just a subtle twist of retro styling. Frosted glass and woodgrain blades lend a rustic charm to this elegant classic. 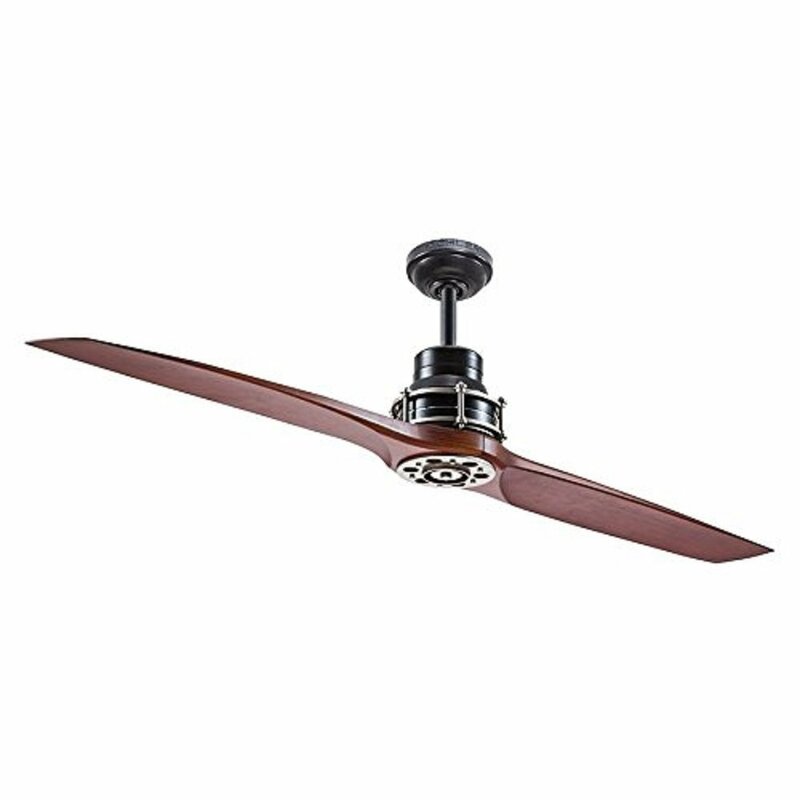 The Westinghouse 7871400 features five reversible blades (oak / walnut) with an antique bronze down-rod and ceiling mount. Elegant brass arms connect the blades to the motor hub, creating a sleek and polished look. The lighting kit consists of four frosted ribbed-glass lampshades that each holds a 60w candelabra bulb. With its 52-inch diameter and flush mounting the Westinghouse is designed for large rooms and low ceilings. Three-speed reversible functionality allows it to bring in a cool breeze in summer or circulate warm air in winter. This vintage ceiling fan comes with a limited lifetime warranty on the motor and all other parts are covered by a two-year warranty. The Westinghouse 7871400 is a timeless design that will add a bit of vintage glamour to any space. This charming ceiling fan / light combination by Ocean Lamp combines rustic materials with some old-school romance. Four blades, finished in maple cherry, fan out from the antique brass centre hub, while the lighting kit consists of three flower-shaped lampshades in frosted glass. The overall effect is delicate and beautifully old-fashioned, but without being frilly or overwhelming. This vintage ceiling fan has a diameter of 42 inches and can be mounted flush to the ceiling or with a short down-rod. It has three speeds and all functions can be operated via remote control. 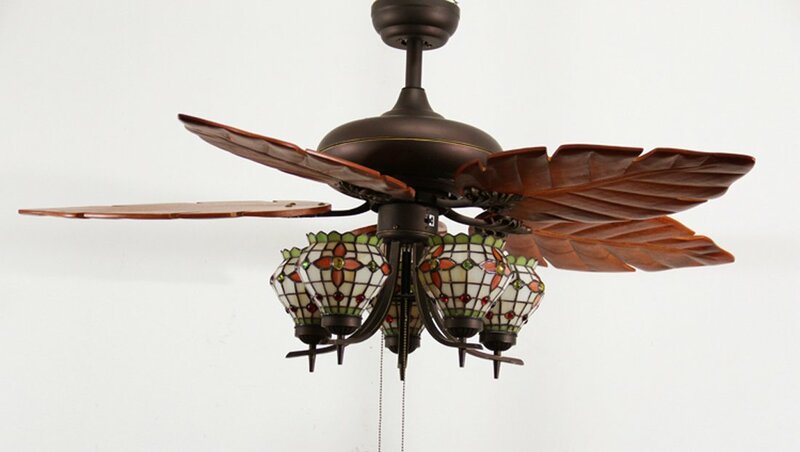 The flower-shaped lamp shades and beautiful Rosewood finish give this ceiling fan some real vintage flair. It is neat and elegant with an old-fashioned charm that will add a spark of character that matches seamlessly with a wide variety of décor styles. With so many styles of vintage ceiling fans to choose from, it really comes down to the size of the room and the overall look you’re trying to achieve. Styling is crucial, but don’t forget that your vintage ceiling fan also needs to be effective. Take note of the technical details when shopping for ceiling fans and make sure you choose one that’s designed for the size and ceiling height of the room you have in mind. One feature that all these vintage examples have in common, is character. By going vintage you’re more likely to choose a timeless design that will fit your overall style even when you make some décor changes. The combination of textures and materials used to create these vintage designs make them interesting and versatile, which means your ceiling fan isn’t ‘just another’ appliance. Whether you’re planning a formal dining room or looking for cool additions to your man cave, there’s a vintage ceiling fan that fits bill.